The future for thousands of young people in Massachusetts is unclear after Attorney General Jeff Sessions announced Tuesday that the Trump administration would end the program known as Deferred Action for Childhood Arrivals, or DACA. DACA granted temporary status to some people whose parents brought them into the country illegally as children. Since then-President Obama initiated the program in 2012, 800,000 eligible recipients nationwide have been able to study and work in the U.S. under this temporary status — including about 8,000 in Massachusetts and close to 15,000 throughout New England. Nineteen-year-old Paola has lived most of her life in the U.S. after being brought from El Salvador by her mother when she was a child. We agreed to use Paola’s middle name because she is fearful that with the end of DACA, she and her family are vulnerable to deportation. Both of Paola’s two sisters are also DACA recipients. After receiving deferred action in 2016, Paola was able to begin college studies and receive in-state tuition. 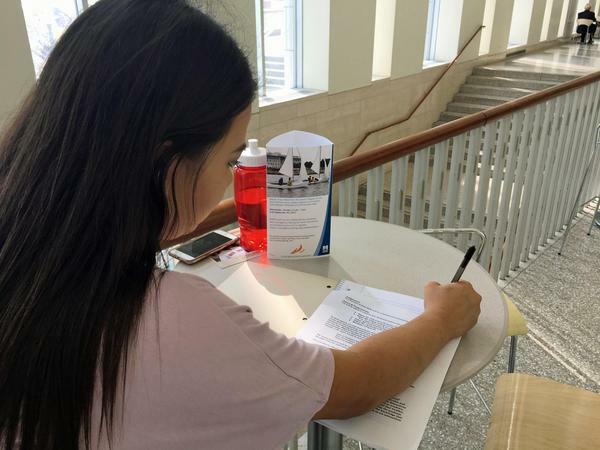 At the end of her first day of classes as a freshman at UMass Boston on Tuesday, Paola said she spent much of the day wondering just how long her college experience might last. 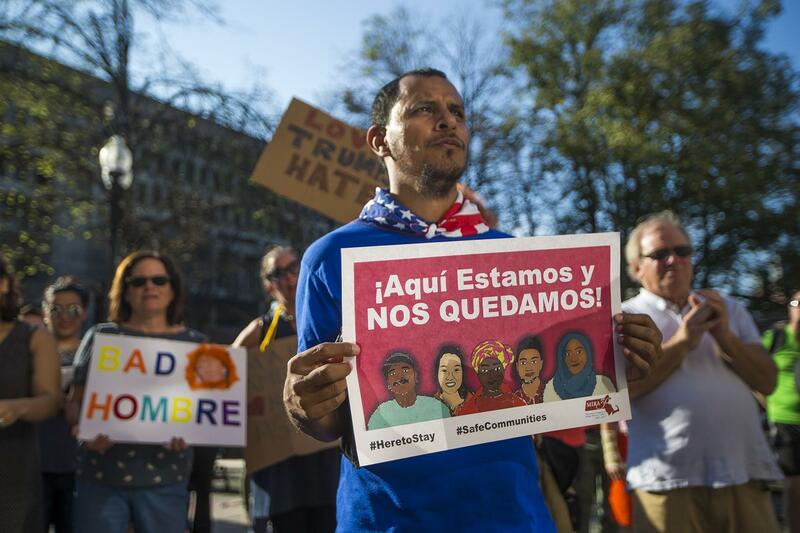 According to the Department of Homeland Security memo detailing the decision, as of Tuesday the Trump administration will no longer accept new DACA applications. DACA recipients whose temporary status is scheduled to expire before March 5 are eligible for a two-year renewal and must submit that application by October 5. For those recipients whose temporary status is scheduled to expire after March 5, their deferred action will end as of the current expiration date. 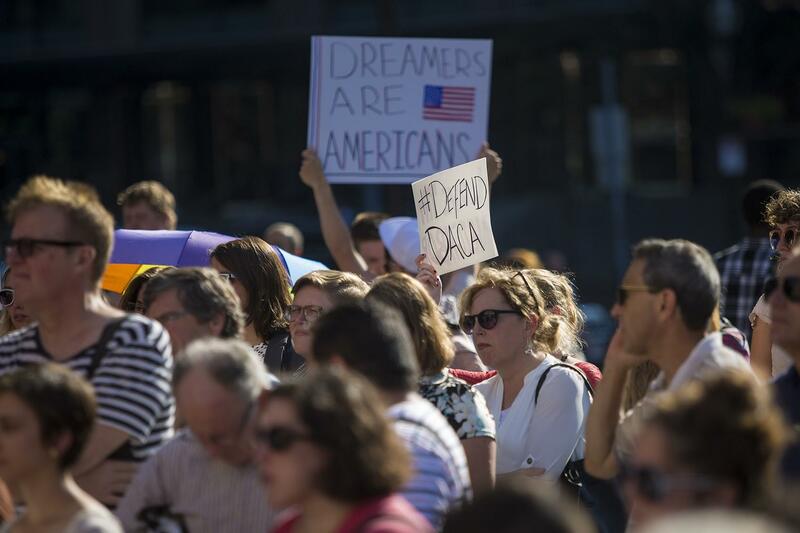 Greg Romanovsky, head of the New England chapter of the American Immigration Lawyers Association, says the elimination of DACA will leave most of the recipients with little recourse. Romanovsky says it’s important to note that DACA recipients were never granted permanent legal status but instead were granted “deferred action” — meaning a temporary suspension of any efforts to have the individual deported. Critics have long argued that Obama overstepped his authority in establishing DACA by executive order. “[DACA] was a massive overreach by President Obama. 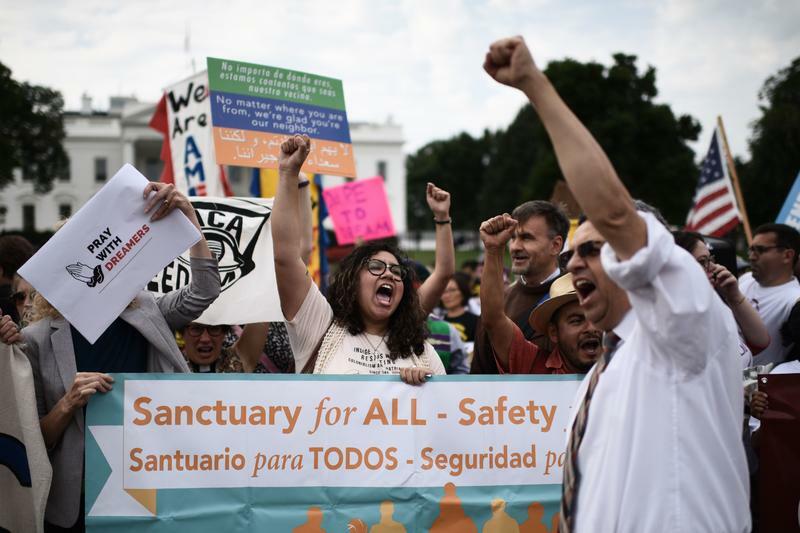 Only Congress has the ability to give immigration benefits to individuals,” Andrew Arthur, a resident fellow in law and policy for the Center for Immigration Studies, told WBUR’s Radio Boston Tuesday. Standing alongside Boston Mayor Marty Walsh and Massachusetts U.S. Sen. Ed Markey during a press conference Tuesday, Attorney General Maura Healey said the Trump administration ignored bipartisan calls to keep the program in place. Healey said she plans to join other state attorneys general in filing a lawsuit against the Trump administration in an effort to protect DACA recipients moving forward. Mayor Walsh said he will work with Healey’s office and issued his own statement to Trump and Sessions, declaring that the two are not welcome in the city of Boston. “This is not enforceable, this is persecution. It’s targeting of people, groups of people, not because of what they did but because of who they are,” Walsh said. Republican Gov. 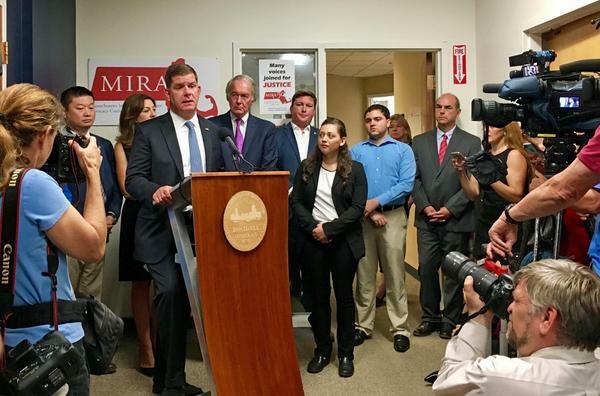 Charlie Baker, who recently riled the immigrant advocate community by filing legislation to authorize local law enforcement to honor some detainer requests from U.S. Immigration and Customs Enforcement, also criticized the decision. “President Trump made the wrong decision today that could negatively impact our economy and many of the Commonwealth’s families,” Baker said in a statement. The administration’s wind-down of the program allows until March 18 for Congress to pass legislation to protect DACA recipients moving forward. Sen. Markey said Tuesday that he has “a little bit of hope” that Republicans and Democrats may be able to come together and work toward a bipartisan solution. Back at UMass Boston, Paola says she’s trying to stay optimistic. 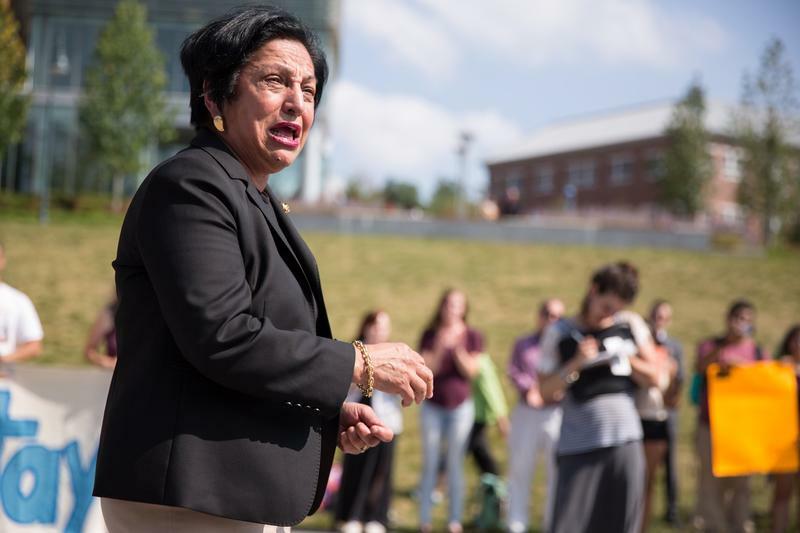 More than a hundred people gathered on the campus of Eastern Connecticut State University Tuesday to protest President Trump’s decision to end protections for undocumented young people. 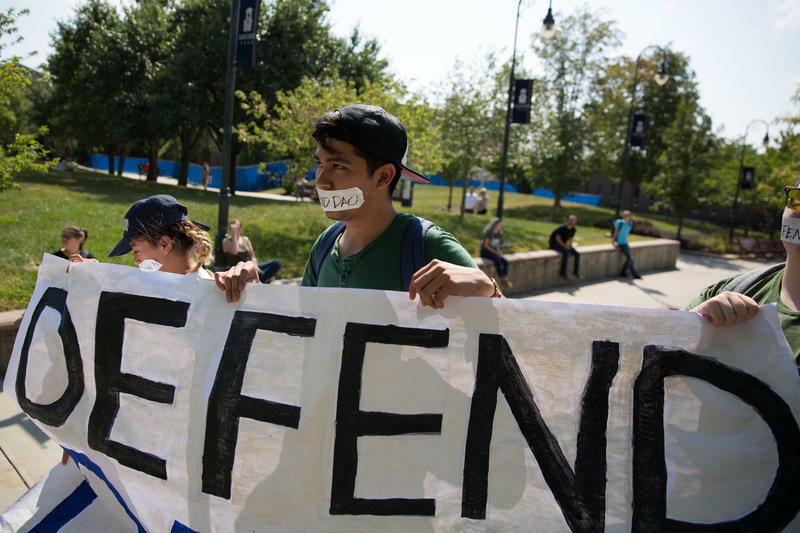 What's The Future For Immigrants Under DACA? Cleanup and damage control has just begun in the aftermath of Hurricane Harvey, and already another potentially catastrophic hurricane, Irma, is headed straight towards Florida. 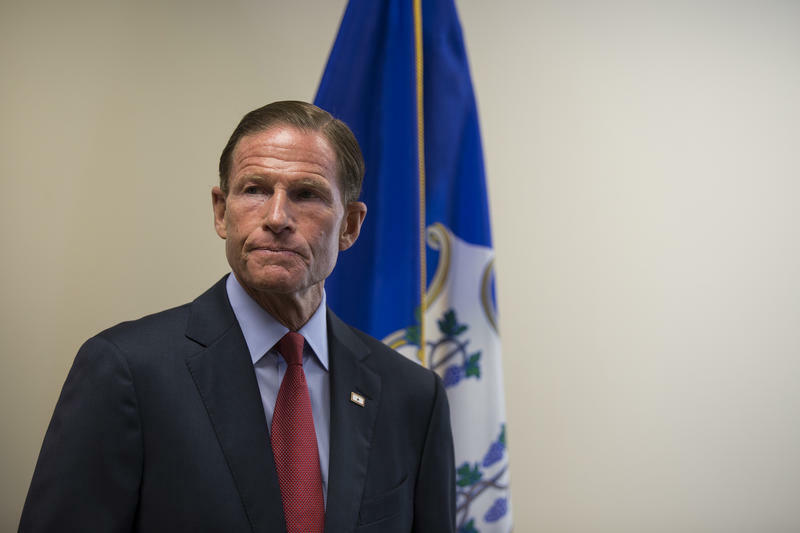 Calling it a "sad and outrageous day," Connecticut Senator Richard Blumenthal has called on Congress to quickly replace the Deferred Action for Childhood Arrivals, or DACA, program. The Trump administration Tuesday formally announced it will end the Deferred Action for Childhood Arrivals program — also called DACA — putting an expiration date on the legal protections granted to roughly 800,000 people known as "DREAMers," who entered the country illegally as children. President Trump issued a statement, saying, "I do not favor punishing children, most of whom are now adults, for the actions of their parents. But we must also recognize that we are nation of opportunity because we are a nation of laws."